Congleton is a town and civil parish that lies on the banks of the River Dane in Cheshire, 20 miles south of Manchester. It boasts around 20 pubs and has a population of 26,000 – a ratio of l:1300. Sample track and CD purchase available from Divine Art. An irresistibly attractive offer! Two for the price of one. Could have also offered 50% off retail price for senior citizens – Wednesdays only, of course. Presented here, still pre-general release, is an image of the C.D. adorned with the fractal-sourced art-work by Peter Vodden. I am fascinated and somewhat amused by the hyperbole, the heightened rhetoric employed by the retailers in their attempts to catch the eye – and the ear – of potential customers. 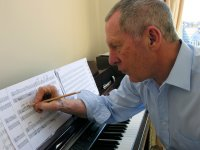 If you care to visit my website, eric craven composer, you will see what I mean. Other retailers use epithets such as “pioneer”, Mary is now elevated to the rarefied status of “firm/enthusiastic advocate” of my Non-Prescriptive techniques. Vapidity has no place in this fiercely competitive commercial forum. And now, for the first time, an aside. Last year I had the honour to chauffeur Stephen Sutton, CEO of Divine Art, from Manchester Airport to the Anthony Burgess Foundation Centre in Manchester. The occasion was to mark the release of a C.D. of that composer by Divine Art. Manchester’s music glitterati were gathered. I was a stranger in their midst. A stranger who spent the afternoon rifling through a comprehensive library of the books of this remarkable author. I purchased several. I discovered Burgess, like me, was born in Harpurhey. I had found fame by association. My first piano was purchased from a second-hand shop, and there were many, always to be found on a corner of a street, in Harpurhey. It came with its own distinctive memorable odour. Many of the springs were missing, hammers did not function, were broken, panels frequently fell from the instrument with alarming loud suddenness. I fashioned springs from copper wiring, replaced missing felt with material from my Mother’s dress-making cache. Crude joinery saw that the pedal mechanism worked after a fashion. On the whole it was better not to pedal. Tuning was never a consideration. To enliven my studies I placed paper, materials, drawing pins into the action and discovered a new world of sonic colour. No longer were scales, exercises and waltzes dull. At the age of 10 I was, unwittingly, a “firm/enthusiastic advocate” of Cage and his experimentation with unprepared pianos. The reviews I have had and the comments I have received via my blog have, to date, been unbelievably generous. These mean so much. They lend me belief and motivation which carry me through those dark unproductive days – and there are many of them – as I struggle at the Music Factory. Some write to tell me of their delight in the progress of my nascent, inchoate life as a composer now appearing in the public domain. It is both a long journey and a short one. Short because it is only a few years ago that I was “discovered” by Divine Art – see the first of my blog. Long because I have been writing, performing and conducting music of many quite different genres most of my life. Conducting pantomime pit orchestras whilst a student at the RNCM. Conducting and arranging for an exceedingly loud 35- piece swing band for ten years. Playing keyboards at many of Manchester’s social clubs. Choral director. Teacher, exhausted. The coming months will may bring some reviews as did the “Set”. My music has, to date, somehow managed to avoid receiving any excoriating criticism. Will this winning streak hold? I will let you know, good or bad.